Looks like we’re going all in on the Mamiko (Kumiko’s sister) story arc. Luckily, it looks to shaping up quite nicely with now crystal clear reasons as to how it relates to the overall plot and the issues that certain characters are currently facing. To start this episode, we receive a flashback to a young Kumiko witnessing her older sister’s band recital. It was this recital that first sparked her passion for music, inspiring her to join band as soon as she was old enough so that one day she could play right along with the sister she looked up to. Unfortunately for Kumiko, Mamiko eventually stopped playing the trombone before she could ever realize that dream. Her sister decided to focus on her studies rather than what she was actually passionate about, and further down the road she realized that was a huge mistake. Now in the present, Mamiko finds the nerve to blame her parents for her own failures. First she gave up band, and now she’s quitting college because she realized it wasn’t what she wanted to do. The pressure her parents (and society) put on her is what she believed screwed her over. To her credit, there is indeed a sort of social pressure in many different cultures where average human beings are expected to do average things, and that it’s better to strive for simple financial stability over any fervent aspiration. However, as her father pointed out, it was inevitably her decision. No one put a gun to her head or slapped her across the face, so when she acts out and blames others for her misery, it goes to show who she’s really angry with: herself. It’s no coincidence that Mamiko’s predicament and remorseful past have very striking similarities to the problems Asuka faces at the moment. While Mamiko was never physically or verbally abused, the choices both girls have to make are essentially the same. Because Mamiko had already made her choice, who she is now is the embodiment of regret. She regrets spending so much time preparing for the future instead of living in the moment, only for her to have absolutely nothing, not even a fond memory, when it doesn’t work out. Hopefully Kumiko will be able to use the example of his sister to help Asuka in her struggles. Meanwhile, Asuka’s continues to drop in and out of band practice. She shows up and insists that everyone not worry, then disappears, then reappears and does it again. At this point it just seems like too much, and apparently Taki-sensei thinks so too because at the end of the episode he decides that if Asuka doesn’t return by a week’s time, she’s not going to participate in Nationals. But before all that, Kumiko pesters Asuka while she’s actually there and Asuka ends up inviting her over to “help her with math”. Obviously Kumiko’s math scores aren’t the problem here, it’s just a simple mask to cover the fact that Asuka wants to talk to her in private. The rest of the episode doesn’t get to the actual study date yet; this was simply just setting up what’s down the line. 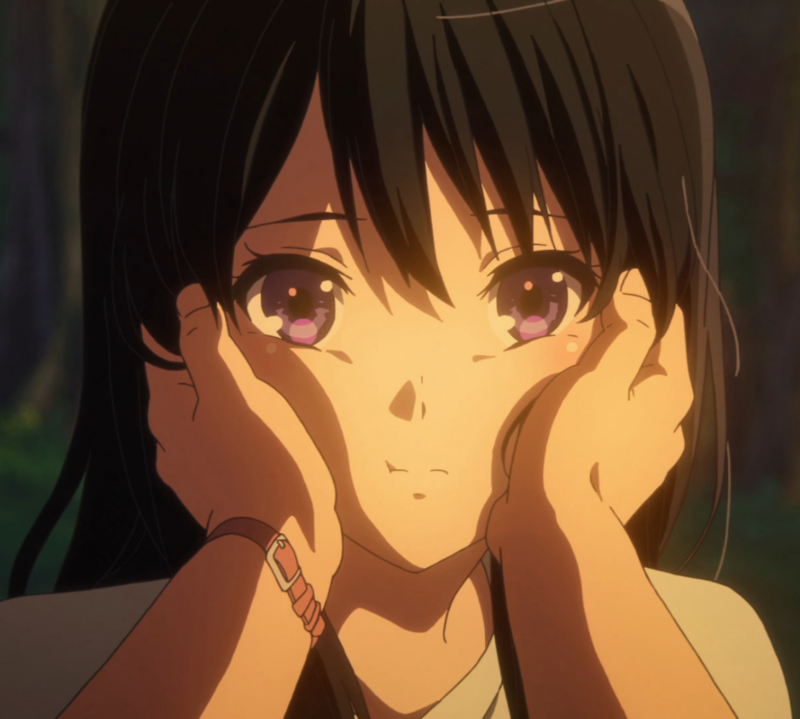 Instead, most of the second half was dedicated to Kumiko being sick. She came down with a fever and had to stay home in bed instead of go to school and band practice. As best friends often do when their bestie is bedridden, Reina pays her a visit. She came bearing gifts as well, some food from other classmates that are worried about her, and a euphonium music album. They listen to it play on the stereo, and only a little while after they start Mamiko barges in to put a stop to it. She can’t stand listening to that kind of music, probably because of painful memories she still holds. Kumiko is fed up with her however, and gives Mamiko yet another piece of her mind as to how stubborn, irrational, and pathetic she’s being. Mamiko leaves the room, leaving Kumiko and Reina to themselves. It’ll be interesting to see what Reina takes from this display, now learning more about her dear friend’s household troubles. Shuuichi shows up just as Mamiko’s leaving the front door of the apartment building, and he reminds her that the reason Kumiko’s in band is because of her. Hopefully this helps her realize that throwing her life away hurt more than just her. Shuuichi invites her to watch the band play at Nationals and that’s about as far as that conversation goes. No confirmation as to whether or not she’ll be there, but surely after some dramatic climaxes and resolutions, Mamiko will end up being there to support her sister. Personally, I’m more invested in the Asuka story still, even though there’s been so little information about her mother or Asuka’s personally feeling on the mother since they were first introduced. Asuka’s a well-established, and beloved character, whereas Mamiko might as well have been just a background character for the longest time, so of course I care more about what to her rather than some stuck up old sister. Although I’m starting to come around to Mamiko now, so at least that’s a start.